This beautifully presented four bedroom home is located at the end of a quiet residential cul-de-sac in the popular suburb of Anarvagos. The International School of Paphos is within easy walking distance and the many amenities of Paphos town are a few minutes’ drive away. Currently a permanent residence, this lovely home is exceptionally well maintained and includes high quality finishes and many home comforts throughout. The ground floor accommodation features a wonderfully spacious living room with formal dining space and two individual seating areas. A guest WC is located near the central wrought iron staircase leading up to the first floor. ​To the rear is a stylish separate kitchen with white fitted units, nicely separated from a cosy and informal dining area/study space by a black granite topped breakfast bar. A well organised store room is an added bonus and a purpose built external utility room houses the washing machine and tumble dryer. ​Four double size bedrooms, two with en-suite facilities plus a family size bathroom are located on the first floor. All bedrooms feature modern white fitted wardrobes and the master and second bedroom enjoy direct access out to a shared balcony with lovely views of the countryside and mountains beyond. Externally there are a multitude of leisure spaces to enjoy including a beautiful courtyard garden to the front of the property with sweet smelling frangipani flowers. To the rear is a fabulous sunbathing terrace, swimming pool and outdoor dining space. Decorative features include a traditional stone planter with ornamental waterfall, plus a small fish pond. Accessed directly from the kitchen/breakfast room and overlooking the pool terrace is a large covered veranda with bi-folding doors, enabling this fabulous relaxation and dining space to be fully enclosed and utilised all year round. 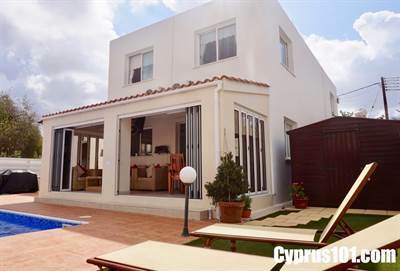 In summary, this quality family home is ideally located for all the amenities of Paphos, including the International School and with so many extras included, is highly suitable as a permanent residence. Furniture is negotiable and the property has title deeds.